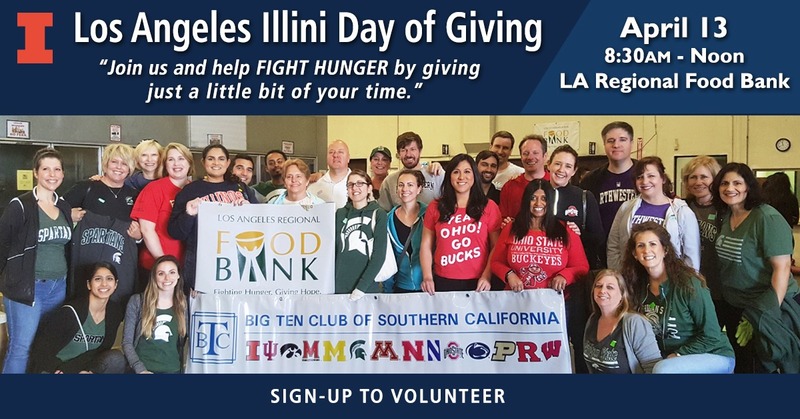 The LA Illini Club invites you to join us for a DAY OF GIVING — with the Big Ten Club! We will be volunteering at the LA Regional Food Bank sorting fresh produce, canned items, non-food items and assembling packages for their various programs. By giving just a little of our time, we can make a big difference in our community. Parking is available on site & nearby but we highly recommend carpooling as space is limited. Be sure to wear your Orange and Blue! Upon registration, you will receive an email confirmation with all the logistics and forms. If you do not receive the email confirmation, please check your spam/junk folder. Onsite and street parking is available. Carpooling recommended. All volunteers must wear closed-toe/closed-heel shoes. Wear (school logo if possible) casual attire (jeans, t-shirt, tennis shoes). Minimum age requirement to volunteer is 14, sorry no exceptions.